Sally:"It's release day for author and psychoanalyst Laurie Hollman, Ph.D. Her book, Unlocking Parental Intelligence: Finding Meaning in Your Child's Behavior offers parents a system for understanding what their children think, want, intend, and feel. 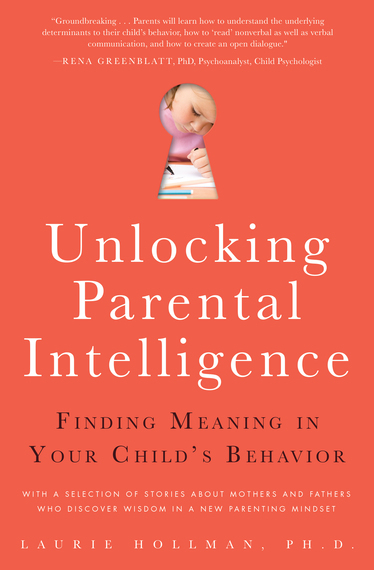 In addition to presenting Hollman's five-step method for developing Parental Intelligence (a term she coined), her book shares case studies that illustrate how her method empowers parents to problem-solve constructively. Publishers Weekly said of the book, "This is a well-written, easy-to-understand book that offers parents useful tools for reflecting on their relationships to their children." A psychoanalyst with specialized clinical training in infant-parent, child, adolescent, and adult psychotherapy, Hollman has been on the faculties of New York University and the Society for Psychoanalytic Training and Research, among others. Her writing on parenting has appeared in the Psychoanalytic Study of the Child, The International Journal of Infant Observation, The Inner World of the Mother, Newsday's Parents & Children Magazine, Long Island Parent, and her popular column, Parental Intelligence, at Moms Magazine. She also blogs for Huffington Post. She and her husband are the proud parents of two spirited, loving adult sons." "Please tell us about "Unlocking Intelligence"
"I use the word, "unlocking" because I believe parents should never be underestimated--even when they doubt themselves. In my book, they are given the tools to "unlock" all the knowledge they have about their child so they can use my five steps of Parental Intelligence to harness what they know to become even more effective parents. Just today a patient told me about intending to buy three copies of my book--one for her daughter who just had a baby, one for her daughter-in-law with her six-year-old grandson, and one for herself. She said to me that her favorite word now is "unlocking" because these ideas have helped her to unlock all the resources from inside her to live a fulfilling life. With Parental Intelligence, you figure out the whys behind your child's behavior. Knowing why your child behaves a certain way will allow you to find the best approach to dealing with the behavior. Understanding why your child acts out, disobeys, or behaves in disruptive, disturbing, puzzling ways is the key to preventing the recurrence of the behavior. Parental Intelligence provides that understanding." "What inspired you to write about this subject?" "It's hard to write in the past tense about being "inspired" because even though the book is finished and published, I continue to be inspired to write about unlocking Parental Intelligence. My inspiration has had and continues to have three ongoing sources for which I am grateful--the children and parents I treat in my clinical practice, my children, and my grandchildren. Furthermore, I'm fortunate to be able to continue to write about parenting and Parental Intelligence for Huffington Post, so I can keep on reaching more and more parents and receive their feedback and questions. I'm still inspired! As my three decades of psychoanalytic practice and research progressed during the years of my clinical work, I incorporated the voices of so many mothers and fathers who came to me at different stages in their parenting careers. They were questioning what to do to salvage their parent-child relationships, asking how to put their children back on a reasonable course, and wondering how to find meaning in their family life. Feeling thankful to those parents for telling me how unlocking their Parental Intelligence benefited their families, I was compelled to narrow Parental Intelligence into five accessible steps for others to read and grow from. My children were raised with the precepts of Parental Intelligence. It was natural for me to want to understand their minds--their thoughts, feelings, intentions, and imaginings. It brought me close to them as they grew. Early on we began to learn from each other as I tried to guide them to think for themselves about making good judgments and choices. It's amazing how wonderful it is to share trust and love with your children. I hadn't coined the term Parental Intelligence when I was a young mother, but I was practicing it nonetheless. Today I have the good fortune to have two empathic, industrious sons with wonderful senses of humor who enjoy learning, creating, and relating well with others in their own individual ways. They have been and surely are an inspiration for my writing. "I can't conclude without thanking the future generation: my loving grandsons Zander, age seven, and Eddie, age four. Hearing their remarkable use of language at such young ages and watching their vibrant youthfulness has always inspired me to keep on writing. When they confide in me their personal thoughts and wishes, I am reminded of the essence of Parental Intelligence; the close bonds it brings between parent and child, grandparent and grandchild." "What distinguishes your approach from other approaches to parent-child conflict resolution?" 2. Once parents understand how their own minds are working, they are liberated to understand their child--how their child's mind is working. 3. Once meanings are clear, options surface by which to change unwanted, puzzling behaviors. When these three core concepts come into play when parents are faced with misbehavior, first they ask, "What does it mean" not "What do I do?" With this in mind, the ambiance of family life fundamentally changes. When parents get to know themselves--their reactions to their child and the many influences on their parenting--they find that they gain a better understanding of their child who wants to be known as he or she actually is. This means that parents no longer focus on the child's specific misbehavior as the overarching troubles and problems emerge. When those problems are addressed, the original misbehavior loses importance and usually stops. Parents learn how to understand the underlying determinants to their child's behavior, how to 'read' nonverbal as well as verbal communication, and how to create an open dialogue. If you could give parents just one piece of advice, what would it be? "The major premise behind Parental Intelligence is that a child's behavior or misbehavior has meaning--and often more than one. Once the treasure trove of meaning emerges, we realize there are many possible reactions to misbehavior. My advice is to not react quickly or even immediately, but to step back and mentally remove yourself from the situation, so you can calmly review it and begin the process of understanding it. I know this is very difficult at first when your child is too loud or too quiet, but with practice it can become a natural response that is very effective. It's amazing how when kids see their parents react calmly, quietly, and slowly they begin to slow down themselves. Parents set in motion a process of self-reflecting for themselves and their child. Children sense the love and care their parent is willing to invest in them and they, too, over time, become curious about their misbehavior. Just one example: I remember a father calling me to share that his eight-year old son screamed vociferously that morning about how his back pack was filled by his father. Perplexed, but cautious, his father didn't react and waited. When the boy was walking out the door, he turned to his confused father and said, "Don't worry, Dad, I don't really care about the back pack. I'm worried and angry about something else I'll tell you about when I get home." This child, at eight-years-old, had already learned his behavior had meaning and he intended to communicate it to his father. That's a remarkable moment! "If you could meet three authors (living or not), who would you choose and why?" "I like this question, because I must reveal that I have fantasies of meeting authors and having conversations with them about Parental Intelligence or life in general. Who would I most like to meet? Hard to say, but I'll tell you about some of the authors that influenced me as I wrote because I would be thrilled to meet them. Two books by the linguist, Stephen Pinker were particularly influential. It would be fascinating to meet and talk with him. I swallowed whole The Stuff of Thought particularly his great chapter, The Metaphor Metaphor. I loved this because parents unwittingly use metaphors in their minds for their kids' behaviors. Is a messy room a cyclone, a hurricane, a disaster, or a disorganized mind? How you construe it affects how you understand it and react. I also read his recent book, The Sense of Style.Only he could write about grammar with a sense of humor. He's a brilliant, reasoning writer who helped me quite a bit with writing questions I had. At the same time, to sharpen my ability to write short stories, I read many. I particularly enjoyed two anthologies by Lorrie Moore, Like Life and Birds of America.Exquisite writing, insightful, touching, and of course beautifully written, these books got me into the space I wanted to be to frame my characters and their life experiences. To meet with her and discuss writing and developing characters I'm sure would be an unforgettable experience. Finally, perhaps an unlikely prospect, I'd like to meet Hillary Clinton, because if I met her I feel I could have a powerful impact on parents and children. Most people think of her as a politician of course, but she's a prolific writer as well with an unparalleled history of working for children from before she was even a first lady in Arkansas. I'd like her to read my book and give me a chance to influence parenting education nationwide. That's a grandiose wish, but it's because I really believe in what I write. I've experienced as a mother and a psychoanalyst how Parental Intelligence brings wide-ranging kids and parents together in long lasting ways. Someone with her stature around the world would have far more influence than I could have." "What books do you read for inspiration?" "This is a good continuation from the last question because I read widely. So I'll narrow my answer to more of the books that influenced my writing of Unlocking Parental Intelligence because then you'll see my range. I already mentioned that reading short stories inspired my writing, so I'll move a bit more to the intellectual plane. While thinking about understanding parents and children's minds, I read Marco Iacoboni's book on mirror neurons,Mirroring People,which addresses the biology of empathy. There's a lot of controversy about this theory and I find it fascinating. Two very different psychoanalytic books that I re-found as I was writing were Mentalization edited by Fredric N. Busch, Ph.D. and Talking to Babies: Healing with Words on a Maternity Ward by Myriam Szejer, Md. Mentalization is a psychoanalytic term that is rather complex speaking to the capacity for self-reflection and self-observation--thinking about thinking. It extends beyond intellectual understanding though leading to an understanding of one's feelings and how the mind works. Actually related but written in an entirely different style is Myriam Szejer's book where she talks directly to an infant about the baby's mother's depression, which led to the baby's suffering. Szejer dares to talk to preverbal little ones recognizing their mental state of mind. Truly innovative therapeutic work. I was very proud to receive her endorsement of my book. 'America seems to be in a period of political dogma, a place where certitude is more important than nuance and understanding." This certainty "is masqueraded as strength, but it really comes out of ignorance and fear. I think you can argue that parents fighting with a child, letting their ego get involved, are doing so out of fear of the unknown, unconsciously using a survival reflex, defending themselves unnecessarily. The only thing that can combat fear is knowledge: knowing there's a technique to deal with understanding what's happening in someone else's mind. And that technique is Parental intelligence. If Parental Intelligence were taught, if people were encouraged to understand one another before reflexively trying to defend themselves, if trying to empathize and know others' minds was seen as a strength, we'd live in a more compassionate, if not more efficient, society.'" "I think you can see from what I've written that writing is an extension of motherhood for me. For years I went to school and worked while I mothered. My kids were accustomed to us being students at the same time. You can see above my younger son is a wonderful writer and periodically when he is around and I'm writing, I stop and ask him to straighten out a sentence for me. He has such a facility with language and sentence structure; it's great. Mothering while writing and doing psychotherapy allowed me to set my own pace. These occupations afforded me the luxury of creating the schedule I needed to keep mothering in mind. My office has always been physically a part of my home, so when I took work breaks, I could periodically run in the other sections of the house and check on things. I couldn't spend time commuting. My practice calendar was always organized around my kids. I remember when I never worked past five o'clock and just referred people out who couldn't fit in my time frame, so I could have dinner and spend evenings with my children. It wasn't only about being a "good enough" mother for them. I didn't want to miss out on sending my kids off to school or being there when they got home. I used to drive my high school kids to school, believe it or not, just to have more time with them. As they got older, I worked longer hours but always had their needs in mind. Even with grandchildren, I still feel the need to stop what I'm doing when they're around. I'm back to planning my vacations around school schedules, so I can see them when they're off from school. I've heard other women say that at the end of the day, when the kids grow up, you have your career. But I don't see it that way. At the end of the day, when the kids grow up, I still have my kids. My career is obviously important to me, but I'm always a mother first--it's the most important and rewarding job. I hope the parents who read my book can get the chance to feel that way if they don't yet."